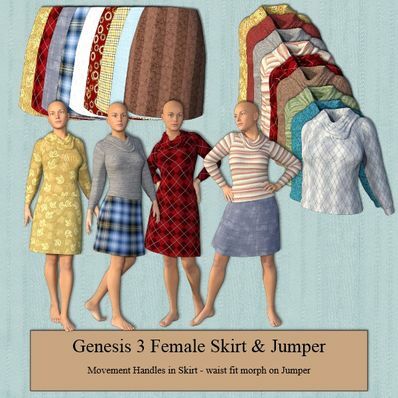 A Skirt & Jumper for Genesis 3 Female for use in Daz Studio 4.6. Movement Handles in skirt and waist fit morph in jumper included. I have also included several Textures. Great! Big Thanks to You! Very nice, normal clothing set! More amazing stuff as always! What's next, a tuxedo dress? Thanks for creating & sharing this practical outfit for G3Fs. This is a very nice fall collection; thank you!! Thank You, Nice outfit, great collar! Perfect, need lots of G3F clothes now, thank you!